There are many things new bloggers are unaware of – one being how to connect with PR companies and brands. Bloggers are known to connect with brands to form symbiotic relationships – they need each other. To be simply put, blogger reviews are typically a quid pro quo for free products. 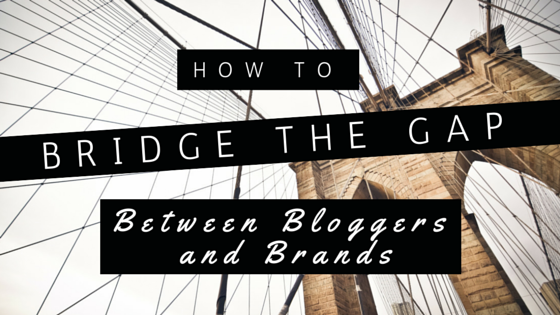 So who bridges the gap between bloggers and brands? Where can one start? 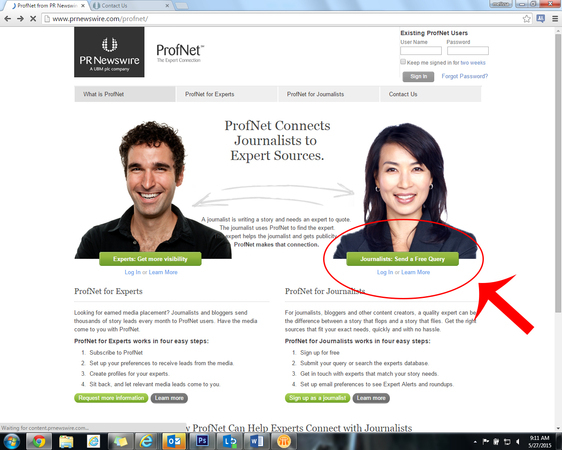 Well, that’s what ProfNet is for. Not only is the service easy, it’s free. 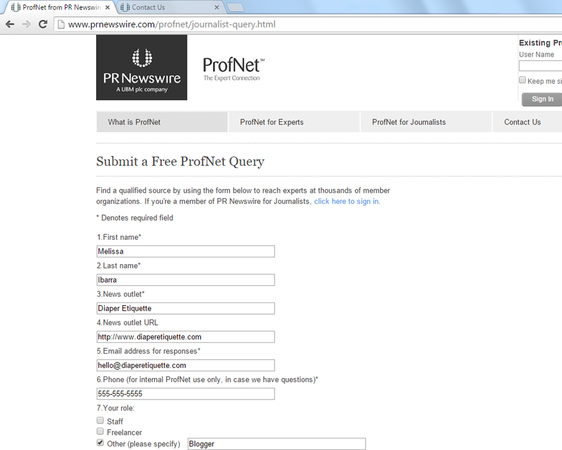 1) Type in www.profnet.com into your Web browser. 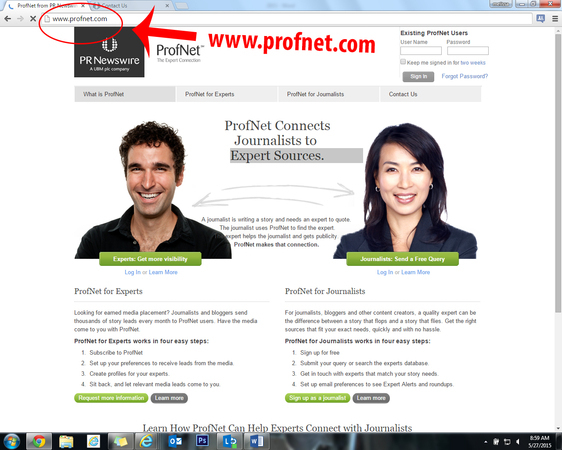 ProfNet caters to two sides: experts and journalists. The journalist side is found on the right-hand side of the page. 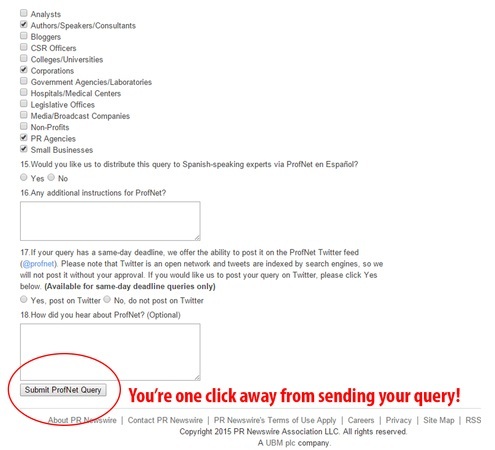 3) Fill out your general information – name, blog name, URL, etc. 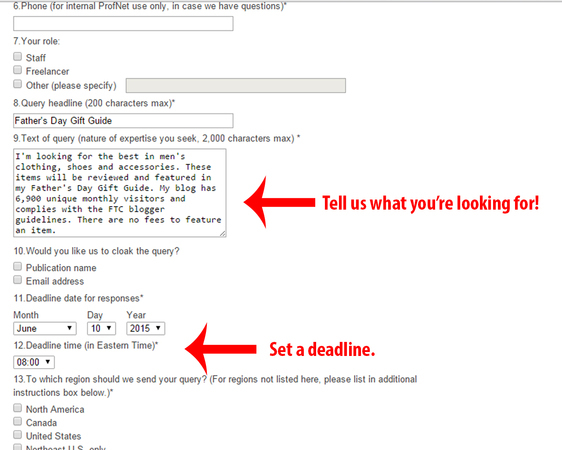 4) Tell ProfNet what you’re looking for and set a deadline. I’m looking for the best in men’s clothing, shoes and accessories. These items will be reviewed and featured in my Father’s Day Gift Guide. My blog has 6,900 unique monthly visitors and complies with the FTC blogger guidelines. There are no fees to feature an item. Feel free to add in any other relevant information or Web metrics. Also, please note our deadlines are set in Eastern Time. 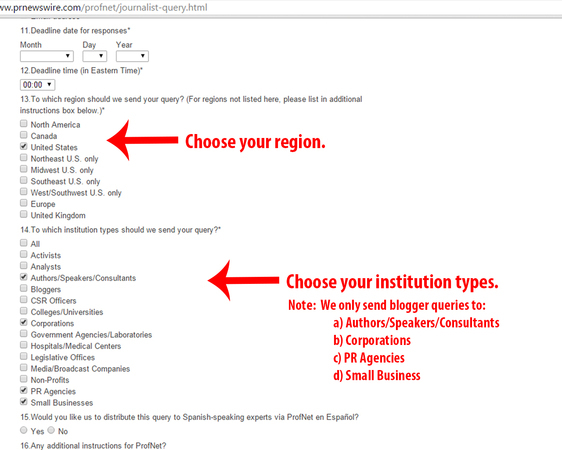 5) Choose the region and institution types of the audience you want us to send your query to. 6) The final step is to hit submit and wait for email responses. Forming your first brand relationship can be exciting. Just wait for the magic to happen and enjoy. If you have any questions, please feel free to email me at melissa.ibarra@prnewswire.com. The only nitpick I have with this is the use of “quid pro quo.” On my blog, there’s sometimes quid pro quo for my opinion, but it’s never preordained. I can say anything I want. The danger is when brands play with fire and team up with “mercenary” bloggers who view everything very transactionally, meaning these types of bloggers are very literal with quid pro quo. They’ll expand the meaning of quid pro quo to mean “preordained wink wink ‘opinion’ as long as the item is free”. This is a dirty dance. It tarnishes one of the definitions of influencers. Example: I get invited to events all the time such as George Wayne’s Downtown 100, and there was a local event the night of Mayweather-Pacquiao, but the people inviting me aren’t expecting anything quid pro quo. Same goes for the brands who mail actual items to me without me even asking. They better be super confident in mailing products to me, because they know I can say anything I want, even negative — or that I might not say anything at all. So there’s no quid pro quo with legit influencers. Mercenaries, yes, and they corrupt the concept because they see things in black and white and are a real blemish on the entire internet. Other than that, great article. Great point! The thing is through this blogger/brand relationship, what these brands get is exposure — whether good or bad. If they really trust in their product’s quality, they’ll expect more good than bad. And if brands do receive bad reviews, they can take that as *constructive* criticism to only further improve their product. 🙂 ProfNet also requires bloggers state they are FTC compliant. Therefore, bloggers can only give their honest opinions. No fees are also involved.